We’re going to talk about how to register your bus without conversion today. Let’s start things off by doing a little visualization…. You’ve bought the bus, you’ve started ripping out seats and things are going well. So you start to think about all of the places you’ll go and the things you’ll see. Then, about that time, the realization will set in and the questions begin to form. I’m doing all this work, but it’s still not registered as an RV. Does my state do an inspection? Does the fire marshall have to sign off? What constitutes a “conversion”? That’s what this post is all about! We’ll go through the process of registering your bus without conversion or inspection. Links to each form is listed in the steps and there are detailed images of the areas of the forms which you need to fill out. If you have questions, feel free to head over to our FB page or our contact page and message me and I will be glad to help you out where I can. Lot’s of folks live in states that make it exceedingly difficult to get a bus, skoolie or coach, designated as an RV or motorhome. States have requirements ranging from a simple inspection to having to be inspected by multiple agencies with numerous requirements. Requirements like permanent waste plumbing (which for us was an issue since we’re using a composting toilet), installed cooking facilities (camping stoves don’t count), and a myriad of other requirements. This is where the Green Mountain State of Vermont rides in on its white horse and saves the day. You can register your bus without conversion in the state of Vermont even if you are not a resident. They don’t require an inspection, proof of insurance or proof of conversion. Though you should check with your local DMV if you need any special endorsement if your bus happens to have air brakes. If you register your bus without conversion in the state of Vermont you will not receive a title if your conveyance of choice is more than 15 years old. Instead, you will be given a transferable registration. I know this seems a little scary but you can use this registration to transfer the title of your bus to whatever state you choose. 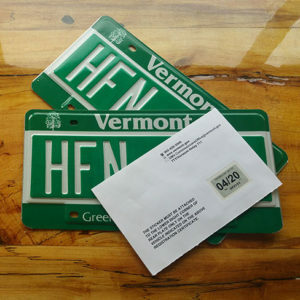 If you have a vehicle that is less than 15 years old, you’ll get a regular Vermont title. VEHICLES 15+ YEARS OLD and NO TITLE: If you do not have original ownership paperwork you will need to provide a copy of your signed and notarized bill of sale and a completed Bill of Sale and Odometer Disclosure Form (VT-005). You can find a link to this form here. Start by downloading Vermont’s Registration Tax & Title Application here. This is form VD119 just in case they change the link. Once you have it fill in the information below as shown in each section as it corresponds to the sections on the form. NOTE: I’ve highlighted the sections of each form that we filled in on the paperwork we sent in, which we know worked. At the top of the form, you will see something similar to the image at right. A bunch of red text outlined in red boxes. This section is for Vermont DMV use only. DO NOT write in this area. Just move on past to Section 1. This is your standard personal information. Fill out anything that applies to your situation. You can leave the Vermont License # field blank unless you happen to have one. Also, if you have a partner (either in crime or in life) you can add them to the registration by filling in the Co-Owner section. 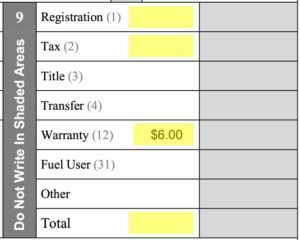 3A: In the unlikely event that you are making payments on your bus, or if you have a lien on it for any reason, fill out this section completely. 3B: Here you will list the previous owner’s information. Again, fill this out to the best of your ability. This section is where your registration actually changes from a commercial vehicle to an RV. First, mark “New Registration.” The only other section you need to worry about is the “Registration/Plate Type” Section. Here in the blank space, you’ll need to write in “Motorhome” and use “(19)” as the plate type designation number. Ironically this is the same designation as “School Bus” in their systems. This is your vehicle’s information. Fill it out completely in the top section. DO NOT fill out anything in the “Trucks” subsection. Even if you fit some of the descriptions in this section, you are not a commercial truck, you are a motorhome. Enter your purchase price. This is how VT will determine what to charge you in taxes. 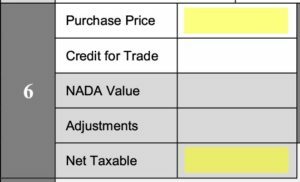 They will base this tax rate off of your purchase price unless your bus can be pulled up in the NADA database, which nearly all buses will not. Multiply your purchase price by their tax rate of 6% to get your “Net Taxable” and enter it as well. You only need to fill out this section if you are tax exempt. If so, enter you exemption number in the appropriate field. If you are not tax exempt, please leave this section completely blank. Here you’ll find out how much you need to write on the check to the State of Vermont. The majority of folks will have a very similar fee schedule. Registration Fee – Currently $76 for one year or $140 for two. If you’re vehicle runs on something other than gas or diesel, check the fee schedule. 6% Vermont Tax – Enter the number you calculated under section 6 titled “Net Taxable.” You can also provide proof tax has been paid. Title Fee – If your vehicle is newer than 15 years old, you will need to add $35 (currently, you can confirm here) for the new VT title. UPDATE: VT sent me a refund check for the warranty fee, so this may no longer be required. Now Sign & Date the bottom of the form and it’s ready to go. 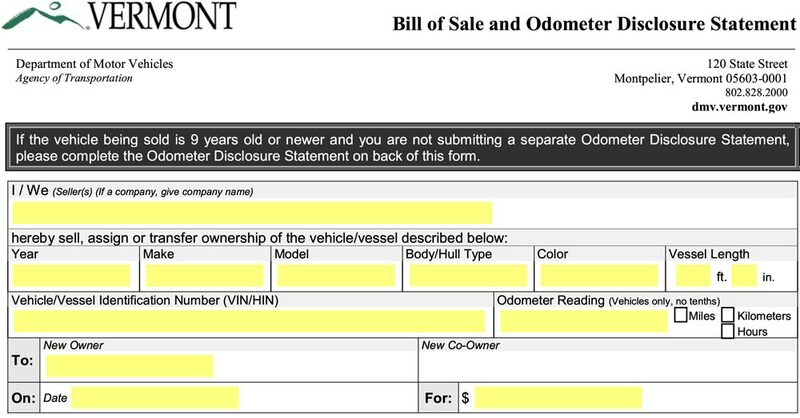 You can get form VT-005 – Bill of Sale and Odometer Disclosure here. This form will verify the facts of the transfer and the vehicle that Vermont needs to complete the registration. At the top of the form, you will need to enter your info, the seller’s info, info about your bus, and some transaction info. You should not fill out ANYTHING, including the signature in this section unless you meet one of the criteria. You will need to fill in all the appropriate information and make sure you have signatures for all buyers and sellers involved in the transaction. After some verbiage, you will enter your vehicle information. You’ll enter your mileage and check the box that best applies to your situation. Enter the seller’s information and obtain a signature and date. This is your information. Fill it in and then sign and date the form. Also, be sure to include a phone number that Vermont DMV staff can reach you at in case of any problems. I threw in my email as well just to be safe. The state of Vermont processes tons of registrations every month and even though you can’t wait to get on the road… they can. After 4-8 weeks (ours took 6) you should receive your new plates in the mail and a day or so later you’ll get your transferable registration (or title). When you get your registration, check to be sure that they designated your craft as a motorhome. If they did not, and there is a chance that they’ll miss it, simply call the Vermont DMV in a smaller city and talk to someone there. They are very helpful folks and will get it straightened out. This is how you can register your bus without conversion, in any state! We hope this helps anyone who is considering this method to register your bus without conversion. Please understand, these instructions are written from my experience when we registered the Wanderlust Bus. Your requirements may be different and your results may vary. There are also lots of folks who are both joining the #buslife and who are using this method to get their plates. This could mean that things at the Vermont DMV could change at a moments notice and they could even stop doing this all together. I also did a video that accompanies this post, which you can view below, but there is A LOT more in-depth info in the post. If you want to check it out, you can do so below. If not, you should still head over to our YouTube channel and subscribe! This entry was posted in Bus Conversion, Education in Motion, Front Page and tagged diy, organic, Bus, skoolie, buslife, homeiswhereyouparkit, tinyhouse, teal, tinyliving, busconversion, tinyhome, tinyhouseonwheels, tinyhouselife, motorhome, minimalism, happy, family, livingsmall, diycamper, compactliving, skoolielife, skoolieconversion, busproject, RV, tinyhouses, natural, eagle15, ourwanderlustbus, eagle, noshoenation, bus title, bus registration, register bus without inspection. Bookmark the permalink. Hey I have a question; for section 5, under Bddy type our title says bus so we just put bus? The title doesn’t say a color. The bus is yellow but we’re painting it white. Should we put white or yellow do you think? Body type should be listed as MH if you want your registration to indicate a private RV status vehicle. As far as color goes, it should be accurate as it will be when you are driving it. That way the registration will match if you ever get stopped by law enforcement. Sorry, last question, 3B is filled out for sure or only if you have a lien / payments? 1) do you still have the vermont plates on the bus? 2) if you do, how is it insured if you live in a different state? We currently still do have Vermont plates, but once we are done with the conversion, we will register it as an RV in our state of residence. This method allows you to get the title converted to an RV without a ton of hassle. So my question might be a bit weird haha. So lets say you live in Nevada or at least have your mailing address there. So you live in Nevada and buy your bus their.. Well then you register is in Vermont. Then after conversion you move travel to Washington state and stay their for a few months. So now you have a Nevada license, a skoolie with Vermont plates & registration, and are currently in Washington State.. Wouldn’t that look bad or funky to a police officer?? How do you explain that?? Would you get in trouble?? I am just asking these questions because I do plan on converting a bus into a home and I do want to travel to all 50 states then pick my “home” state. So I am just confused on how that will all work out.. Thanks for taking the time to answer as I am confused on this subject haha. Hey Kim, first thanks for stopping by. You register the bus in VT, but this is only for the purposes of converting your commercially titled bus into an RV title. This is a legal “grey area” so I would steer away from driving on these plates but merely using the registration to then transfer your plates to your chosen state of residence. You must still abide by the laws of your state, most of which, say that you must register vehicles within 30 days upon moving to the state or acquiring the vehicle. Hope this helps. I bought an old Ambulance in Washington state back in 2000 after getting back from fishing in Alaska. I still had my Minnesota license at the time and ended up driving down to Salt Lake City and stayed for a few months. My insurance was actually taken out in Portland using a friend’s address there. I never did get pulled over, but I don’t think I would have gotten in trouble if I just explained my situation. I eventually had everything listed as Minnesota when I made my way back to home base. Oh also how would you figure out insurance for your skoolie if your license and registration are different states?